This is a Prey guide. 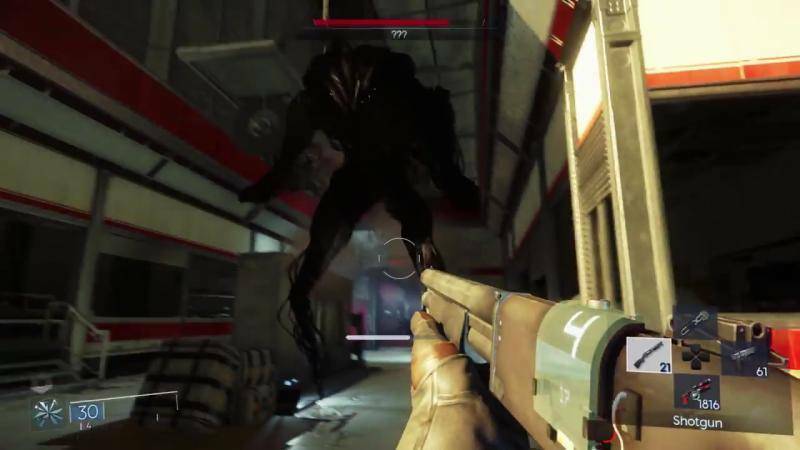 Here you will find details on the Nightmare, an enemy you’ll encounter in TALOS-I. The Nightmare is a kind of phantom, or at least like the phantom. However, it is almost impervious to many attacks, and relentlessly pursues Morgan throughout the station. Once you take a lot of energy, morph, or telepathic neuromods, the nightmare comes into play. This monster can kill you with one hit if you don’t properly protect yourself. Nightmares are not easy kills. Once the “A Nightmare is hunting you” objective comes up on screen, you have 2 minutes to hide. Otherwise, prepare yourself for an intense battle that you can’t hack with just your wrench and some powers. Use your environment–particularly turrets, heavy objects (with leverage I, II, or III), and mindjacked or created phantoms. Use your powers as well. Using psychoshock or a nullwave transmitter will allow you to disable the nightmare’s abilities. Chip away at its health with Kinetic Blast and then use your q-beam to destroy it. If you can’t fight it, head for the nearest exit from the area. This is the fastest way for you to evade the nightmare. If you are in areas like the Arboretum, however, you can try hiding in Alex’s office until your two minutes are up. Narrow pathways and buildings that require hacking or key cards are very strong for hiding(don’t forget to lock the door however). The materials/rewards you get for fighting this monstrosity are simply not worth it.